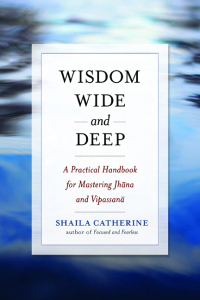 This book, Wisdom Wide and Deep, follows and amplifies the teachings in Shaila Catherine’s acclaimed first book, Focused and Fearless: A Meditator’s Guide to States of Deep Joy, Calm, and Clarity. Readers will learn to develop this profound stability, sustain an in-depth examination of the nuances of mind and matter, and ultimately unravel deeply conditioned patterns that perpetuate suffering. This is a profoundly practical guide, the fully detailed manual for the mind sure to become a trusted companion to many inner explorers. Click Here to purchase both of Shaila Catherine’s books at a discount.